jbs inspiration: Summer Camp with Becky Novacek! 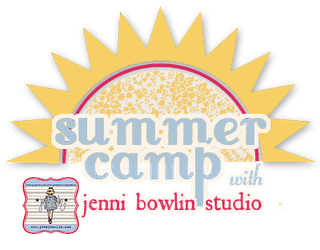 It's another fun day at Jenni Bowlin Studio's Summer Camp! 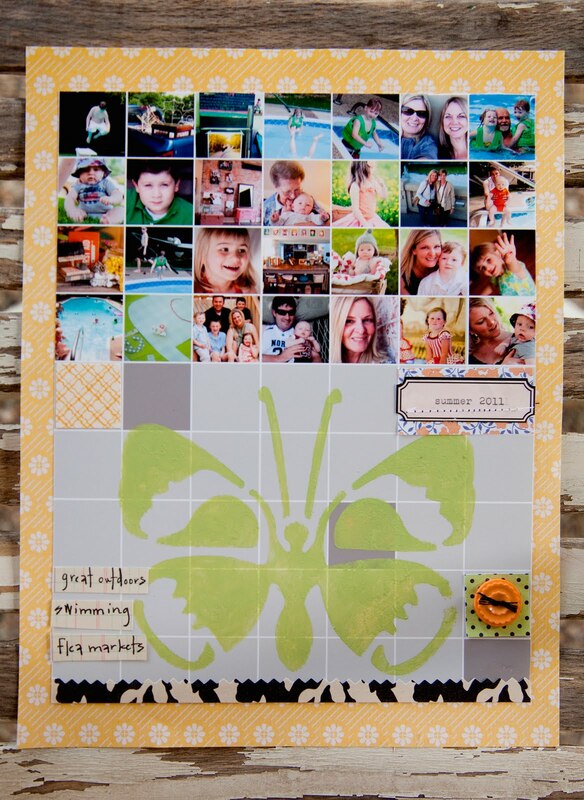 Today's camp instructor is Becky Novacek who brings you another fun twist on the multi-photo layout . . . I sometimes feel badly that I don't get more of the many photos I take in a scrapbook. I really enjoy creating one photo layouts, however, I think for those of us who like to make one photo layouts, there are ways to make the same design concept work for multi-photo pages. I simply loaded 28 photos from the summer (so far) onto a Paislee Press photo template Vol. 25 (it's available through O'Scrap and it's free! ), leaving the bottom rows unfilled. That left room to do some creative details and a little journaling. I incorporated the exclusive JBS butterfly mask, using the JBS Dabber in Stick Candy, which made me very happy! A few simple bits and pieces of JBS pattern papers, a button, a label and strip journaling finished it off. One idea I had as I was putting this together was how great it would be to print off a number of these and have a page for each of the kiddos. I'm making separate albums for each of them, so this would be a great way to use a lot of photos that I want them to have. I hope this inspires you to try something new! P.S. 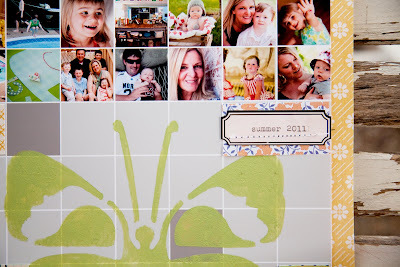 the awesome butterfly stencil is an exclusive to our July Papercrafting Kit which is sold out. There may be one or two left after billing, so you could get your name on a waiting list if you are still interested in it. Grab a membership to not miss out on any more of our new exclusive stamps and stencils! We'll have a peek at those on the 20th of each month. This is gorgeous! I love Beckys projects! Awesome layout! Thanks for the tips!!! Great post....I am a great fan of Becky Nevacek.All her projects are worth appreciating.Keep it up!!! !